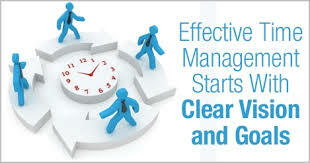 Major purpose of this article is to suggest some guidelines for Time Management. Time management may be the act or technique of planning and performing exercises conscious control over how much time spent on specific activities, especially to enhance effectiveness, efficiency as well as productivity. You will always be surprised at just how much you can accomplish daily with some structure, prioritizing and commitment with your personal life along with your office. Below we examine some steps you possibly can implement today: Prioritize, Set Goals, Use a To-Do List, Don’t Abandon Tasks, Identify Your Prime Time, Banish Time Thieves, Use Rules and Filters, Schedule Your Day, Schedule Internet and Social Media Time, Stop Delaying etc.